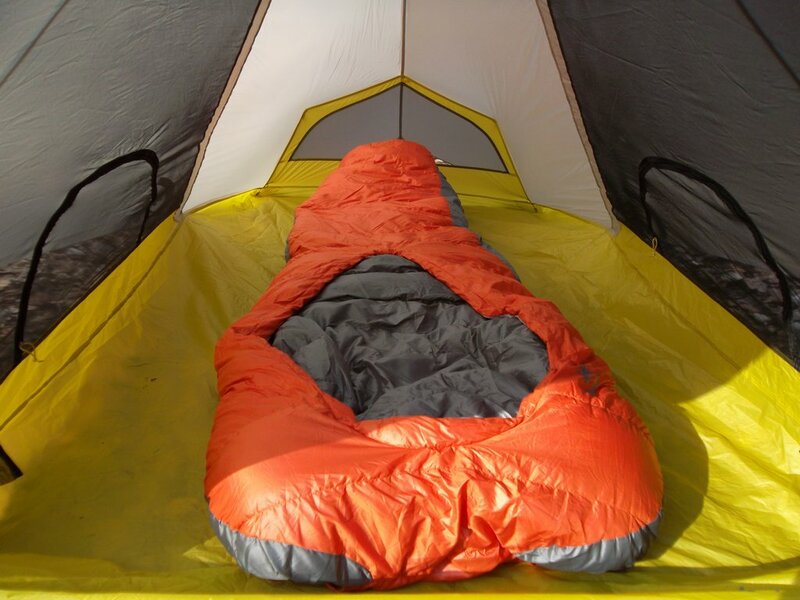 The Sierra Designs Backcountry Bed is an evolutionary way to rethink the modern sleeping bag, but can evolution keep you out of the cold? I decided to find out by subjecting the sleeping bag to the challenges of riverside camping, deep inside the gorge of a local hiking favorite in the smoky mountains. The cold, damp, 40 degree airflow rolling off the water just feet away would cause a challenge for any sleeping bag. How did it hold up? Sierra Designs has been trying a lot of new things lately. The Backcountry Bed is no exception. The concept here is to make you feel like you never left your bed at home. They do this by eliminating zippers, adding room to toss around, and implementing a sort of top quilt to the top of the bag. This allows you to simply sit up and slide out of the bag, or tuck the sides in around you for some extra warmth. The bag comes in multiple fill weights of DriDown (600-800) and various amounts of fill to suit multiple temperature conditions. The version I tested was the 600 fill (800 fill is lighter for the same warmth) 2 season (cooler than the 3 season), which weighed a very respectable 2 lbs, 8 oz. A skimpy 2 lbs even for the 800 fill version. The sleeping itself has no insulation directly under your back to cut weight, which works very well as flattened insulation doesn’t insulate. Instead the bag relies on the insulation from your sleeping pad. This works very well. The bottom of the sleeping bag is left free to flop about, while the upper body of the sleeping bag can be coupled with your sleeping pad. This enables you to toss around within your sleeping bag, and move your legs about, without getting twisted up in your sleeping bag or rolling off your pad. The bag is light weight, especially if you spend a bit extra to go for the 800 fill bag. It packs up small, and takes up minimal room in my pack. The materials feel fantastic against the skin which is great, because you’re going to want to snuggle up with this lofty bag. The bag is soft, and the “quilt” of the bag is great to curl up with. 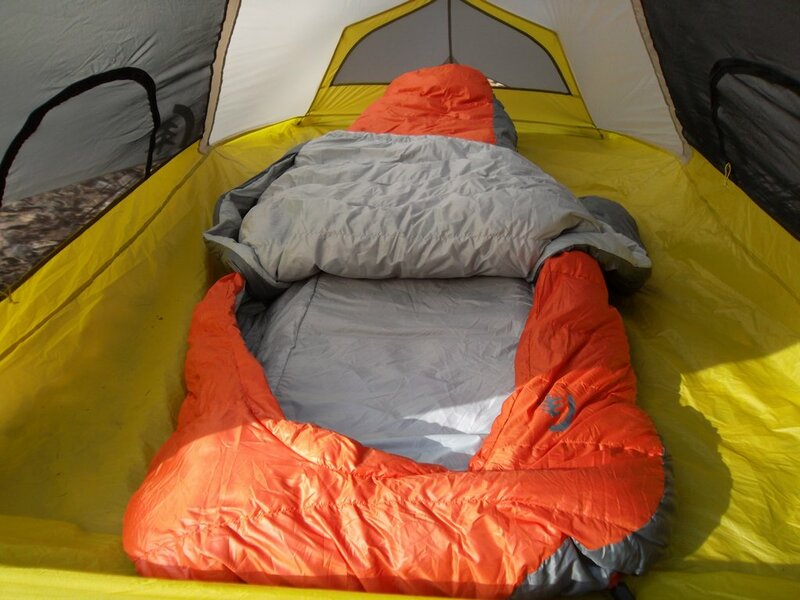 It’s a real bed kind of comfort that you don’t find with traditional sleeping bags. The “quilt” of the sleeping bag, which is basically a super fluffy, over sized comforter attached to the top of the bag, remains free to be manipulated as you need. It’s fixed permanently near your waist. This gives you many options on how to use it and your hands are basically free at all times to work around in the tent. The adjustable nature of the quilt allows for great amounts of temperature control. You can tuck it inside the bag for extra warmth, or leave it thrown on top of you like a comforter for some mild venting. You can also turn down the quilt altogether if you’re enjoying a nice warm night. If you’re a stomach sleeper, the quilt even has little pockets you can put your hands into, allowing you to keep your arms covered as you squirm around. I even found myself curling it over my face, leaving my mouth out for venting while blocking out light during an incredibly bright full moon. There are so many options it’s almost playful. The bag feels true to the temperature ratings, keeping myself ( a mildly cool sleeper) very warm into the low 40’s with nothing on but my base layers. The 35 degree comfort rating seems spot on. I didn’t notice any cold spots, even around the quilt. The damp, river side, east coast air didn’t seem to affect the DriDown at all. Even with the moist current flowing through the tent the bag didn’t loose any loft at all. A foot vent allows you to slip your feet out for extra venting, completely hands free. The bag itself has plenty of internal room to spin around if you’re a gator roll kind of sleeper. Plenty of room means you don’t feel trapped. In fact, you can pop out nearly instantly if the occasion arises. 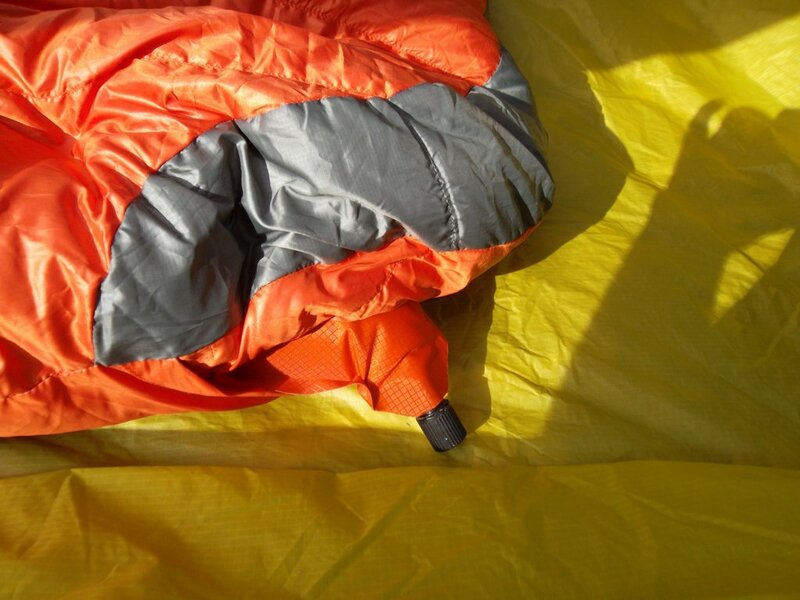 Slipping in and out of the sleeping bag is the simplest, fastest, and quietest I’ve ever tested. No zippers. It’s hard to find much to complain about on this bag. The one thing that did manage to get in my way, was I found myself wishing the quilt went a bit further down. 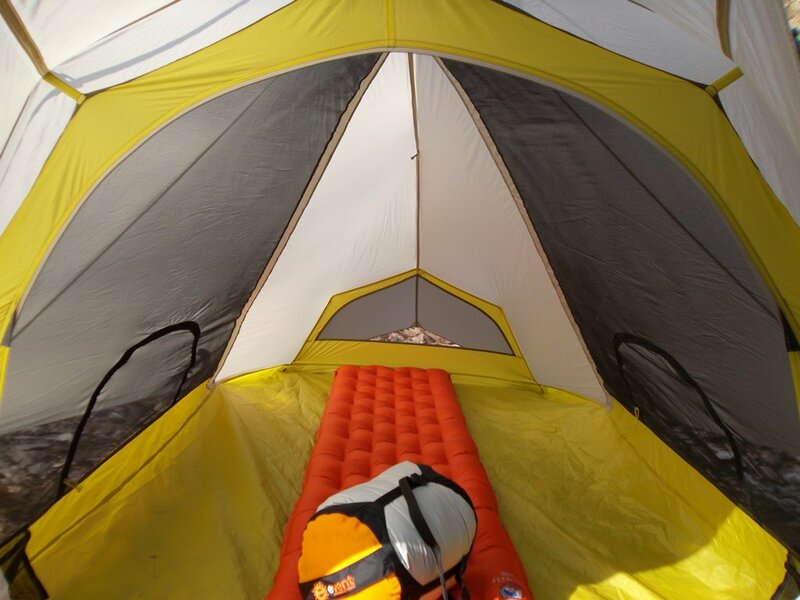 A few times I tried to sit straight up, finding myself snug against the bottom of the quilt just above my waist, where it connects to the sleeping bag. I still managed to make it up, but had to do a little bootie scoot to be completely free. Still much better than fighting a zipper. Sierra Designs wanted to do something new, and it worked, again. They’ve designed one of the most comfortable, most functional, most convenient sleeping bags I’ve ever tested. The ability to move your arms freely, and to use the quilt to wrap around yourself in various ways just feels like fluffy freedom. The bag is warm, draft free, lofty, and is simply gleeful to slide into and out of. If being comfortable while you sleep is your priority, I think you’ll find yourself right at home with the Backcountry Bed.